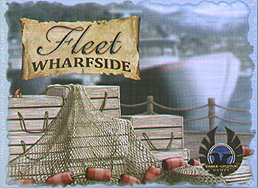 Wharfside is a stand alone card game set in the Fleet universe by its award-winning design team. The fleet has come home and in Wharfside its captains must fulfill contracts from local Ridback Bay businesses. Each turn players will either collect fish from their fleet at the wharves or purchase a contract from the market. Contracts provide a bonus while in play but once they are completed the bonus goes away too! Choose and complete the most lucrative contracts and reap your rewards.